These statues are part of the Boston Women's Memorial on the mall on Commonwealth Ave. The Memorial celebrates three important contributors to Boston's rich history - Abigail Adams, Lucy Stone, and Phyllis Wheatley (not pictured). The sculptures are by artist Meredith Bergmann and represent her thinking about public art. Unlike conventional statues that are larger than life and set upon pedestals, these statues are more human-sized and invite viewers to interact with them. Pictured above are two views of Lucy Stone and Abigail Adams. 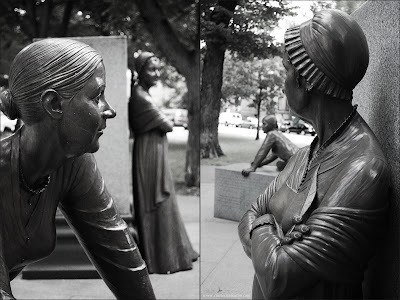 The first one on the left Lucy Stone looks off to the distance with Abigail Adams in the background; the second panel was taken from the viewpoint of Abigail Adams. You know, I never noticed how lovely these statues are until now. Your photos bring the best out of them.